Refurbished Digital Cameras - Great Deals or Gadget Garbage? When we wrote our original high end Apple Mac Pro vs PC DIY build article (and the follow up entry level Mac Pro vs PC DIY build article), we used our experience and available information (including pricing information from many competitive retailers) to tackle a comparable PC DIY build, with the hope that we could do it better and cheaper. While we did fail to match Apple's specific build for a lower cost, we did come away with an appreciation of what they had done for their users after ignoring them for the past 3 - 4 years. There was also much discussion amongst enthusiasts on how one would build the "PC Alternative" with other components that could potentially create a more powerful (and cheaper) machine. The other takeaway was the issue of upgradeability with Apple's new Mac Pro. Something that the last generation Mac Pro was quite adept at thanks to its close ties with standard PC DIY components. But also thanks in part to the efforts of one of few Mac specific upgrade companies. Other World Computing (OWC) creates upgrades for seemingly impossible Mac upgrade issues that can't be solved with an off the shelf PC component. 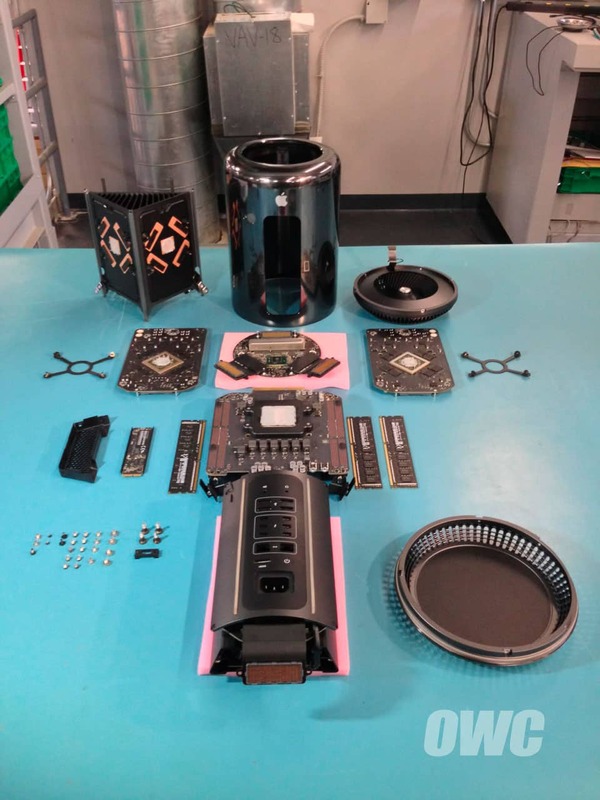 Thanks to their latest post and along with the excellent work done by iFixit and their latest Mac Pro 2013 teardown, we are finally able to figure out just what you will be able to upgrade in Apple's latest "high modded PC". When we approached our original article, we were fairly cautious about the upgradeability aspects of the machine's processor. With Apple's relentless pursuit of gluing things down, and the previous issues with "delidded" CPU dies in previous Mac Pros, we weren't really sure what the prospects were for Mac users looking for an upgrade to extend the top level performance of their machines down the road. Thanks to OWC's tear down, we now know that the CPU is definitely a socketed LGA2011 unit and that it is properly capped to ensure that any same socket CPU from the same generation will fit in that spot. While this will be good news for folks picking up the entry level model looking to upgrade down the road, upgrades for the top level machines will likely need not only only software support, but likely firmware as well, to support higher multiplier and clock speed, as well as to properly ID the chip. Although Apple will likely introduce new chips down the road for their high end machines, a board revision or even a CPU generation revision, may shut the doors on future upgrades. Unlike the PC DIY space, Apple does not have to support CPUs that they've never sold in specific configurations. So we can say for sure that if you go the entry level build, you have somewhere to go, like to a 12 core processor down the road. But if you go the top of the line system, you probably have no where further to go but back to the shopping cart for your next machine. Also, the chipset is neither an X79 nor a C600, but a special custom chipset that supports Thunderbolt, which no off the shelf board currently does. On the bright side, you can at least upgrade the heatsink paste with something better to reduce temperatures. There have been a large number of comments questioning whether the D700 is the FirePro W9000 on the high end (or that the D300 is really a FirePro W7000 at the bottom end). If you look at how GPUs are put together, they are defined by their silicon features, and then their clock speed. For example, if a GTX 780Ti comes in an overclocked and then a superoverclocked version, does that make it a different GPU? Of course not. And that's how we see the direct comparisons between the Apple Mac Pro GPUs with their retail PC DIY counterparts. Apple needed to bring the total power draw of all components in their system to a certain level to maintain the design goals they wanted to achieve. So instead of using a lower end GPU, they underclocked a better one. Or, as some of you might be thinking, in order to get a system that beats a PC DIY system in pricing, they might have bought the chips that could not achieve higher stable clocks speeds, and bought them up at a great discount. Same GPU. Lower clock speed. But better performance for professional apps written to take advantage of everything inside each GPU (when clock speed is not a factor). Back to the upgrade question, it's quite clear that based on OWC's tear down work, a GPU upgrade option looks bleak. Not only do GPUs on the open market have to come with the proprietary connector, but both software and firmware have to support the GPU, especially if its an NVIDIA Quadro option, which at this point, may never happen. And while the FirePros are very powerful GPUs, they may not be the optimal option for certain software (like Adobe Creative Cloud etc) today. Did we mention that one of them would have to have a special slot for the SSD to plug into? Even in PC DIY circles, PCIe SSDs are starting to become popular. And there are new standards just around the corner (SATA 3.2/SATA Express) that promise a direct interface with PCI express for storage needs. Apple owed its Mac Pro users a future proof option for internal storage connectivity after abandoning them. So instead of dealing with outgoing standards, they leapt ahead and integrated new technology into their latest professional desktop. Something that their higher end Macbook Pros have been using for a little while now to achieve the storage performance that they really can boast about. OWC has said that they will have solutions available in the very near future, but many users are looking for multi-drive solutions today. For example, in content creation and video editing, scratch disks are often internalized, while it's quite OK to have the project itself and its files, on an external solution. Although a single drive solution is OK for notebooks (to maintain form factor/size), this would make the new Apple Mac Pro a more flexible content creation platform for video and effects editors, with an option for at least one or two more SSDs. As seen in the iFixit Teardown of the new Mac Pro posted recently, that the SSD strapped to the back of one of the GPUs is slightly different than its twin. If a second GPU with the same connector could be added, then potentially, this could be a spot to plug in that second SSD. This would of course be an extremely costly upgrade as you're shelling out for a second GPU just to get the connector. And then it might not even work. So in a nutshell, the upgrades and options for this connectivity option on the new Mac Pro are on the way. But you're going to need to get them after market from companies like OWC at this point until the PC DIY market starts jumping onboard. And we can't see these options being "inexpensive" until the technology reaches critical mass. Today, the only way to get single 16GB DDR3 ECC 1866MHz modules to work is by using a workstation board and an INTEL Xeon processor. There just don't seem to be enough hardware support (and availability) of non-registered DDR3 modules in that density. And if they did, they'd likely be very expensive and they still might not work in the boards that you want to use them in. ECC (registered) DDR3 modules are available in densities up to 32GBs and are supported by many workstation grade boards. The new Mac Pro has the Xeon, has the custom chipset that supports ECC, but only has four slots. OWC has already said that they will be creating high density kits specifically for the new Mac Pro, but if you can find ECC DDR3 1866MHz modules from regular PC DIY channels, you'll likely be OK with a reputable brand. We did find some 1333MHz DDR3 ECC 32GB single modules for around $649, with AMD RADEON (Patriot?) branding though. So in terms of memory modules, that's a definite yes for upgrades. You can buy the same speed 1866MHz DDR3 16GB ECC modules today for an upgrade down the road for your entry level Mac Pro. And when 32GB DDR3 ECC 1866MHz memory modules start rolling out from OWC and other memory manufacturers, the price will hopefully be more competitive by then, like around when those shiny cylinders start shipping in quantity around February 2014. So the new Apple Mac Pro does have SOME options for upgrades. And when I mean by some, I mean the most likely candidates which are the memory and the PCIe SSD. The CPU and GPUs on the other hand are a mixed bag (or an empty one depending on how you look at it). It would seem that it's all up to Apple based on the fact that the new Mac Pro uses neither an x79 nor a C600 server chipset, but a custom one with Thunderbolt support (which no Intel chipset currently supports). And in order for the CPU to work properly, firmware support will need to come from Apple as well (or require an entirely new daughterboard). This means the hardware upgrades that PC DIY users currently enjoy on the CPU side might be locked out for our Mac brethren. Unless you are working from the entry level configuration and doing upgrades along the way with supported components. On the GPU side, it looks even worse. Coupled with a very proprietary form factor/connector, firmware and drivers will need to come from Apple to support new GPU families from AMD, and you'll probably be out of luck for NVIDIA Quadro options unless a partnership is reached down the road. Even the MXM standard used for notebooks has been around forever and it's nowhere near being "standard" despite the fact that everyone uses some variation of it. I'm not hopeful for this Apple initiated one. Because higher end parts typically need more power, the tear down has also revealed a highly integrated power supply, which will likely need to be replaced, if you did start to add higher end parts into the mix. iFixIt has a very good look at this piece and it appears to be no more than 450Watts. This means any replacement would also have to meet the same power requirements in addition to the firmware/software support. It also means overclocking the GPUs to W9000 speeds is out of the question. In light of the new information on potential upgrades, does this change your mind about the new Apple Mac Pro? UPDATE: At CES 2014, we caught up with Other World Computing (OWC), who is the leader in DIY upgrades for the Mac ecosystem. We spoke directly to their CEO, Larry O'Connor, and in our exclusive interview, we cover exactly what is (and isn't) upgradeable on Apple's New Mac Pro 2013. You can check it out here.